I am sending you 2 more pictures one is a closeup of the face of the ring. 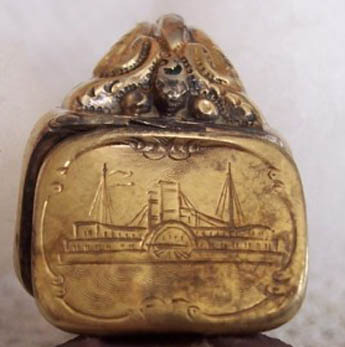 We still havn't had much luck figuring out the boat or the owner of the ring but I have taken the ring to a person who specializes in restoration and cleaning so I supposed to get it back this week. Again the story behind the ring is it was found in Upper East Tennessee between Bulls Gap and Greeneville, our thoughts are that a group from Louisiana called the Washington Artillery ( a unit from New Orleans) was the group that was camped here. Besides the ring there were 3 Louisiana cuff buttons found within a 12-15 ft circle around the ring. 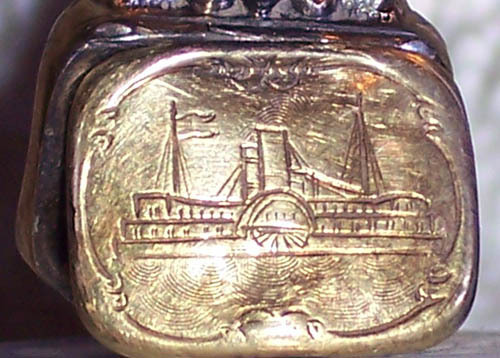 Of course I still feel the key to the ring is the picture of the boat on the front, Identifing the boat will probably give us the name of who owned or captianed the boat and possibly the owner of the ring. Again Thanks for your help.